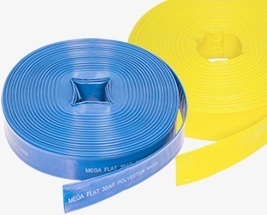 Our HydroSure Layflat Hoses are flexible, reinforced hoses with excellent resistance and a high working pressure and temperature. Ideal for use in domestic, commercial and industrial settings, they are used for the transport and discharge of water, liquids and chemicals and are suitable for a wide range of uses including pumping water, supplying garden and horticulture irrigation systems and fertilising crops. Their flat design makes them fully collapsible, taking up far less storage space than a regular hosepipe.